A kilogram of boiled chickpeas, a few pinches of lemon salt, a whole lot more of kosher salt, a dash of tahini, ice as needed, and half a liter of olive oil: the recipe for Lebanese style hummus. I mixed the ingredients inside the industry grade mixer. The hummus turned out a little grainy. My trainer tasted my blend and shook her head. I’ve never made hummus in my life. I never really got into Middle Eastern cuisine until I dated Suzy. She was so deeply into Middle Eastern culture that she even had a photo in front of those blue houses in Alaçati displayed proudly on her social media pages. I worked at the deli at a grocery once, which got me the lateral training necessary to work as a prep cook. It felt a little weird for another career change in my almost middle age, but I needed out of my dead-end relationship. I wanted to move on from Suzy. I completed the hummus order and proceeded to char some eggplant for the moutabel dip. I remembered tasting the same eggplant dip from last December when I took Suzy to this same restaurant. My trainer told me it was one of the hardest dips to make. While roasting the eggplant, we made preparations for the pomegranate sauce. “Today’s my last day,” the trainer told me. “I’m moving to Surrey,” she said. Behind the coded smile was one of nostalgia and missed opportunity. Though I ended my first week a little bit more experienced with her training, in a way it was her way to impart a legacy before moving on with her life. She didn’t introduce herself, nor did she ask me for my name. I guessed it was the polite way of passing on the torch without getting too attached. I wondered if it would have been easier if Suzy and I had a no strings attached, two-night stand. A play on Heart’s “All I Want to Do Is Make Love to You” instead of The Cure’s “Fridays I’m In Love” in a nightmarish Groundhog Day mobius strip that spanned months. The sexual obsession cost me my sanity and ultimately, my day job. We tested the boundaries of cultural exchange, but it ended up as most failed relationships did—a few endearing memories and a lot of baggage. Pomegranate molasses, deep fried garlic, olive pomace oil, and more salt—all thrown into the mixer to end up in a sweet and zesty flavor. Once I made the sauce, I transferred it into several condiment bottles. It appeared that they were running low. My trainer deep fried some cauliflower and asked for a sauce bottle. Once the cauliflower was golden brown, the pomegranate sauce was generously dispersed into a mixing bowl. Now I wanted to ask for a discount on how easy it was to make makali. I remember the date. We ordered a vegetarian platter: spicy hummus, spinach dip, moutabel, and the goddamn cauliflower. Suzy couldn’t taste anything that night because of her allergies, but the platter cost us upwards of sixty dollars. I enjoyed her company; it felt like a perfect price point that day. I cleaned the mixer and readied it for the spinach dip. My trainer had a smile on her face while making the dip. I could see why: it didn’t take much effort. I checked on the frozen spinach—it hadn’t thawed out, so I prepped the rest of the ingredients while waiting for the main slice to thaw. I checked on my eggplant and killed time by mincing parsley. Last I heard Suzy moved back in with another ex. I really shouldn’t care, but I did and that momentary lapse in concentration led me to nick my ring finger. My trainer had me shadow her as I waited for my wound to dry. My trainer passed me a glass of seasonal ale, which I drank heartily. I used to love Hefeweizens and Kronenbourg Blancs until Suzy got me obsessed with the bitter beers and full bodied ales. In turn, I got her reading Murakami. I remembered she still had my copy of Sputnik Sweetheart she lovingly stained with sundried tomato spicy hummus. Suzy told me if we hadn’t dated, she would never in her life have picked up a Murakami novel. I myself wouldn’t have tried moutabel dips and makali. Our tastes collectively grew more eclectic. Perhaps it was our legacy to each other’s lives. I imparted my passion for Japanese culture, which wasn’t my own and I received an appreciation for her enthusiasm for Middle Eastern culture. The exchange went beyond the boundary of our physical connection. 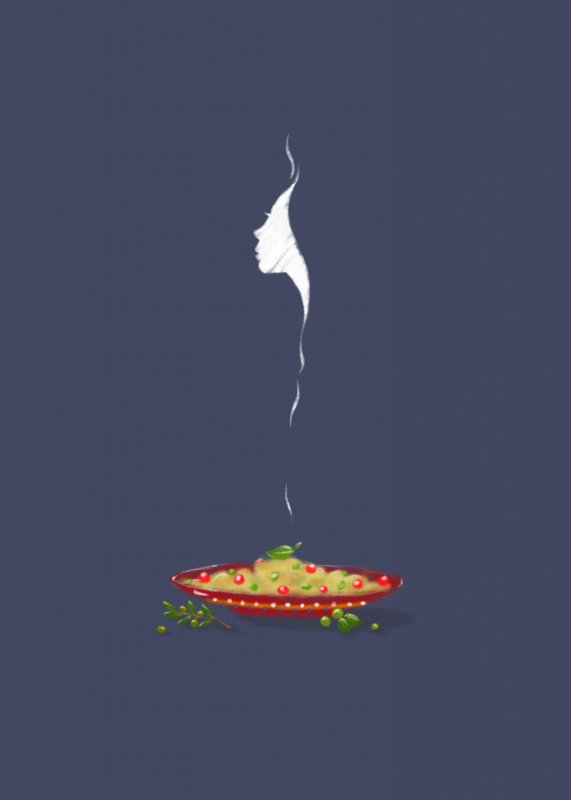 “Order!” I bellowed as I finished topping off the chickpea lentil salad. An eager waiter took the plate to the next client. A young man shared the meal with a more mature lady. Suzy was sixteen years my senior, so that lady could have been a lover for the young man or his mother. My trainer smoked a Djarum Black at the back and we shared the kretek filter. Suzy and I used to share a kush rolled on a thin zigzag paper, lit with her stove matches. We usually made love after. “I’m gonna miss this place,” my trainer said. She shrugged. I enjoyed the high from the cigarettes and I stood in place for a good long moment. “I guess.” She took a long drag. I remembered hearing that anecdote from Suzy as we worked on our platter. Frolicking down Granville Street that night, searching for a place to dance, I asked to kiss Suzy. After long awkward moments of vacillation, we finally did while overlooking Granville Island. Last time my lips touched another was with my fiancée inside a Ferris wheel carriage before she broke off the engagement. I wonder if I would have any more moments such as that. “Before I know it, I’ll be fifty,” my trainer said. Without acknowledging the statement, my trainer finished her cigarette, and then her shift. I took home a take-out box and waited for my bus. Then I changed my mind and walked down Granville Bridge. If it wasn’t for Suzy, I wouldn’t have accepted the gig to the restaurant. I would’ve continued to traipse a stagnant retail service existence. Overlooking Granville Island, I opened my take-out meal and had a bite of the deep fried cauliflower. The tart sensation left a bittersweet aftertaste foreshadowing an uncertain future in the horizon. Meghan Ang is an illustrator and animator living in Vancouver, British Columbia. Her work often incorporates motifs of nature and the home into her work, and draws much artistic and thematic inspiration from her ethnic heritage. She is currently pursuing a masters degree at the Centre for Digital Media.